Brightly colored fruit bounced against a stark black background, timed to a peppy tempo. Every beat was a chance for haptic design to bring people closer to the produce. The goal? To sell M&S Foods, a UK-based grocery store. People don’t usually think of food as having much in common with motion, but food ads often do. Haptic designer Brian Sherry described food as a vertical that is ripe for tangible textures. Unlike other verticals, ads for food products often don’t have a narrative. Brian explained that more often, food ads are product shots in motion. 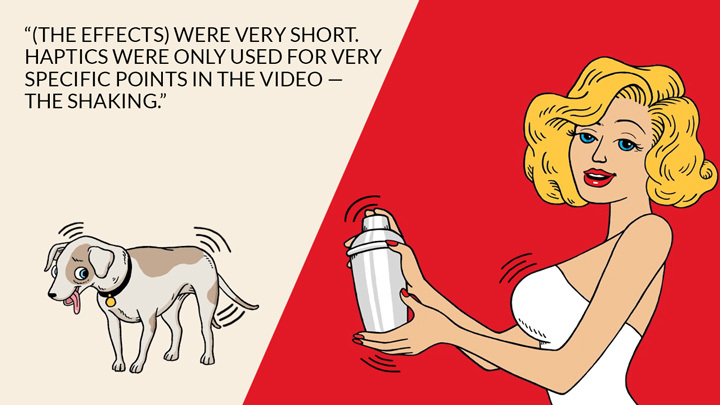 For example, an ad on which his team worked for Stoli Vodka compared an inferior version of shaking, visualized as a nervous dog, to a dressed-up bartender shaking a martini tumbler. “(The effects) were very short. Haptics were only used for very specific points in the video — the shaking — to emphasize everything else,” Brian said. But sometimes, food ads are less about the cooking and more about grabbing attention. One ad his team created for San Pellegrino, the fizzy water beverage, used different kinds of balls to convey a sense of energy. The balls were made of different materials, like rubber and metal. 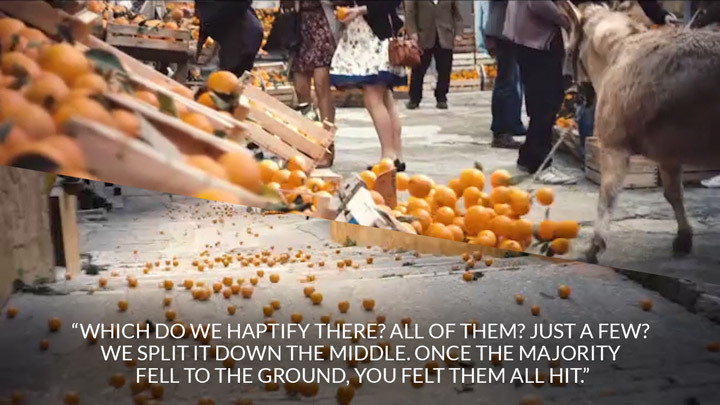 This ad was unusual for food and beverage products in that it featured a narrative. Starting at the top of a hill, a pair of lawn bowling balls rolled through a hilly Italian village, ending at the ocean. Chaos ensued. In general, though, haptic design for food ads brings out the quality of the food. “We’ve done at least one beer ad where we haptified pouring liquid,” he said. “Coke ads often have close-up shots of bubbles exploding from the glass, which works well,” Brian said. When it comes to food, people know what to expect from all of their senses, so haptic design for food is closely related to the ad’s audio. “If I asked you to imagine what it sounds like to have a Coke pouring into a glass full of ice cubes, you’d understand what it sounds like. It creates a lot of bubbles, and you can feel the ice cubes move in the glass,” Brian said.